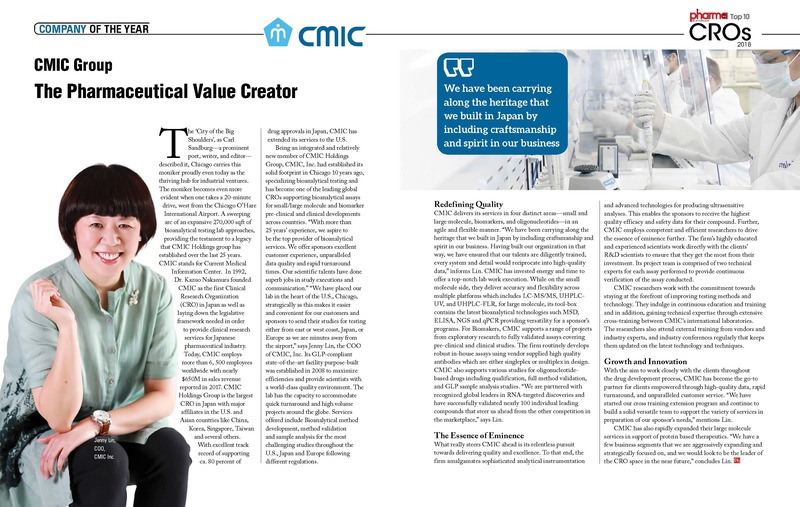 CMIC, Inc., a subsidiary of Japan’s largest CRO CMIC Group, announced today that it has been named as “Company of the Year” by Pharma Tech Outlook Magazine. CMIC was selected among the top ten CROs chosen to represent elite service providers; both the annual list of companies and the top award were selected by a panel of experts and members of Pharma Tech Outlook’s editorial board. Pharma Tech Outlook is a well subscribed magazine in US and has become a driving force for the various Pharma and Life Sciences enterprises enabling them to move a step ahead and increase their ROI by offering them a platform which can help them better understand the industry dynamics and advise the course of action. Pharmatech Tech Outlook identifies the most innovative as well as best-of-breed solution providers in the industry and showcase their expertise in the editions. Once a year there is one special edition focusing on CROs and as a results Top 10 CROs will be selected for US CROS. Among those one will be given “Company of the Year” award. Pharma Tech Outlook has chosen CMIC as one of the Top 10 CROs 2018 based on an evaluation of CMIC’s in-depth experience providing cutting-edge expertise to optimize drug development for pharmaceutical companies for over 25 years. The annual list of companies is selected by a panel of experts and members of Pharma Tech Outlook’s editorial board. Pharma Tech Outlook commented “We are glad to announce CMIC as one among the Top 10 CROs 2018. CMIC has long been a leading CRO across the globe and plays a vital role in the industry. Please visit CMIC, Inc. website for further information. © CMIC HOLDINGS Co., Ltd. All rights reserved.